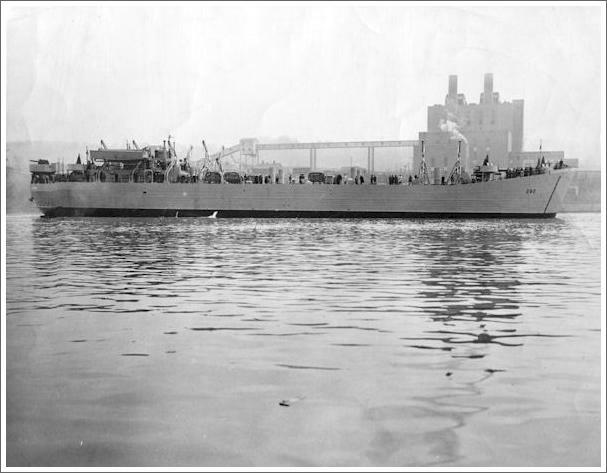 As the son of a builder of "Ambridge" boats I have found the LST-282 story moving. In reviewing the photos of the ship I would like to comment on the photo labeled Mississippi River. It seems to me the 282 is pictured in the Ohio River adjacent to the Leetsdale ways where she was launched. The power plan on the opposite riverbank seems to be the Phillips Power Station located across the river from the Leetsdale Yard in South Heights, Pa. On my last visit to Ambridge, the plant site was still being operated by Hussey but has been significantly changed. The assembly yard which dropped gradually to the riverbank level has been built up with a significant dike to reduce flooding problems at the plant. The railway between American Bridge and Bethlehem Steel has been recovered for commercial use. There remain references along alleyways to "the barge railway" but not even vivid imagination can visualize the facility used to transport the subassemblies between the plants. By further comment I have not been able to locate anyone at Hussey Metals Plant in Leetsdale who about the library of photos that were stored there as late as August 1973 relating to the operation of that plant site as the construction yard for the "Ambridge" boats. I will try to find some older former co-workers from Hussey to see if we can locate the photos with the intention to scan and preserve some of that material. If the effort is successful you and your site will share in it. I was born and grew up in Leetsdale during the WWII period. I can remember watching LSTs being launched, particularly after church on Sundays. On Thursday of this week I sailed on a ferry, the Cape Helopen, from New London, CT to Orient Point, Long Island. On her bow was the information that she was originally LST 510, and participated in the Normandy invasion, landing at Omaha Beach. She was refitted and rebuilt several times over the years, and now serves a peaceful purpose. As I sat on the deck during the trip I pondered the thoughts of those on board that day in June, 1944, as so many young men sailed toward those beaches. It was a surreal experience. Later I decided to do a little research on these ships and verify some of my childhood memories. As best I can determine LST 282 was not built by Bethelem Steel in Leetsdale (where my father worked at the time, and within sight of my house), but at the American Bridge and Iron Company in Ambridge, PA. These two towns (Leetsdale and Ambridge) ran together and the American Bridge plant sort of overlapped the two places. I could walk to the plant entrance in 5-8 minutes from my house. See: http://www.insidelst.com/design.htm and look at the inventory at the bottom of the page. If you wish more information on this topic search Google.com under the keywords LST Ambridge. You will see 3 pages of hits. Also, if you check: http://www.landingship.com/282/new.htm you will see LST 282 a few minutes after launch. The building in the background is a power plant on the south side of the Ohio river that could be seen from my street in Leetsdale. I enjoyed your website and found many of the accounts by those who have replied to be fascinating. I hope you learned a few new things from this e-mail.